Trump's comments came shortly after Iranian president Hassan Rouhani warned of "severe consequences" if the administration "betrays the deal." WASHINGTON — President Donald Trump said Tuesday that if Iran resumes its nuclear program "they will have bigger problems than they ever had before." While welcoming French President Emmanuel Macron in the Oval Office, Trump again lashed out at the Obama-era nuclear accord with Iran, calling it a "terrible deal," and saying it is "insane" and "ridiculous" that the agreement does not address Iran's possession of ballistic missiles or its destabilizing actions in places like Yemen or Syria. "If they restart their nuclear program, they will have bigger problems than they ever had before," he said. 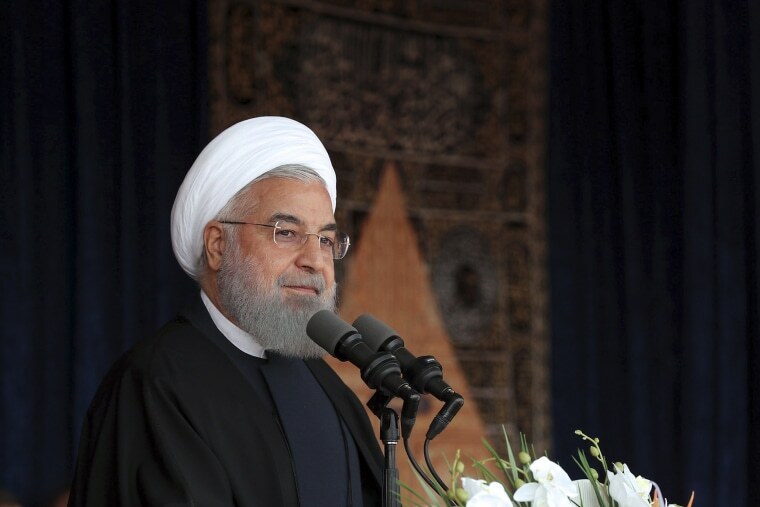 Trump's sharp comments came shortly after Iranian president Hassan Rouhani reportedly warned of "severe consequences" if the administration "betrays the deal." "I am telling those in the White House that if they do not live up to their commitments ... the Iranian government will firmly react," he said, according to Reuters. "If anyone betrays the deal, they should know that they would face severe consequences." Shortly after the pomp and pageantry of Trump's first official state visit began on Tuesday, his split with Macron on the Iran nuclear deal was on display. The White House has hoped to enlist European allies in new negotiations with Iran, but Europeans are pushing back on the idea of canceling the agreement, saying it would alienate Iran and prompt it to go rogue. Macron believes it would be a mistake to end the deal. "We made this terrible deal, but we're going to discuss it," Trump said. In May, Trump will once again have to decide whether to recertify the Iran deal to Congress. If he doesn't, he could begin the process to reversing the deal. Iran has threatened to resume enrichment activities if the deal collapses. Macron said Tuesday the Iran deal needed to be discussed in the broader context of the region. "We have a common objective," Macron said. "We want to make sure there’s no escalation and no nuclear proliferation in the region. We now need to find the right path forward." Journalists peppered Trump with questions on a number of different topics, including whether he intends to pardon his personal attorney, Michael Cohen, should he be convicted of a crime. The FBI raided Cohen's home and office this month.